Thor visits Australia! A short mockumentary catching up with the Norse god of thunder. Previously only available at Comic Con, a short film showing Thor’s trip to Australia (featuring Dr. Bruce Banner ) was released by Marvel Studios. While the final scenes of Avengers: Age of Ultron sent Thor and the Hulk down a different road, one which left the Asgardian and green goliath absent from the battle at Berlin airport back in late April this year, A new mockumentary by director Taika Waititi catches up with Thor’s new domestic arrangements. Thor’s “What are infinity Stones” chart hints at the power and mind stones, and references Nick Fury, plus Captain America’s indestructible shield. The red reality stone, and it’s connection with Dr. Jane Foster, is also on the chart, along with a green stone next to the label “Time Stone”, confirming that the time stone is green in colour. The yellow sugar sachets visible in the cafe are found across Australia, just in case there was any doubt of where the mockumentary was made. Darryl’s email to Tony Stark as dictated by Thor mentioned Tony Stark creating a “possessed robot”, which is none other than Ultron, who was possessed by the AI built into the crystal shell surrounding the mind stone when it was still attached to Loki’s staff. Convoluted? It’s just like the comics. Darryl’s tie also matches his Bike. Good sartorial and transport choices. Thor: Ragnarok is currently set for a November 7, 2017 release date, and is distributed by Marvel Studios. Strong choice of colour and details. Themes of the environment, and identity. Colour throughout the comic builds up a specific tone for each scene. Background details in the comic show off key points of identity for Roz Soloman and Dario Agger. While early scenes in the comic deal with Dario Agger’s past, a scene on Asgardia shows off the miraculous colours of the Bifrost bridge, and gold clockwork that drive Asgard’s connection between worlds. Colour effectively lays out the main emotional moments of the comic. Dario Agger’s past is painted with black and blood red. Thor takes down a horde of trolls under fiery orange light. Thor, hammerless, laments his loss of worthiness, and sombre blue light floods the page. Jane Foster rests in the Asgardian Hall of Medicine, which is surrounded by Sakura pink trees. Their colour and falling petals set a romantic tone when hammerless Thor visits Jane during her rest. Several key connections between characters are made here, which speeds their development: Dario Agger and Malekith, Thor and Jane Foster. Thor meets with a popular SHIELD agent on his search for the new Thor. observes many meetings and events that he passes on to the hammerless Thor. But hammerless Thor is far more interested in identifying the name and face of the new Thor. The woman wielding mjolnir is mostly absent from this comic. 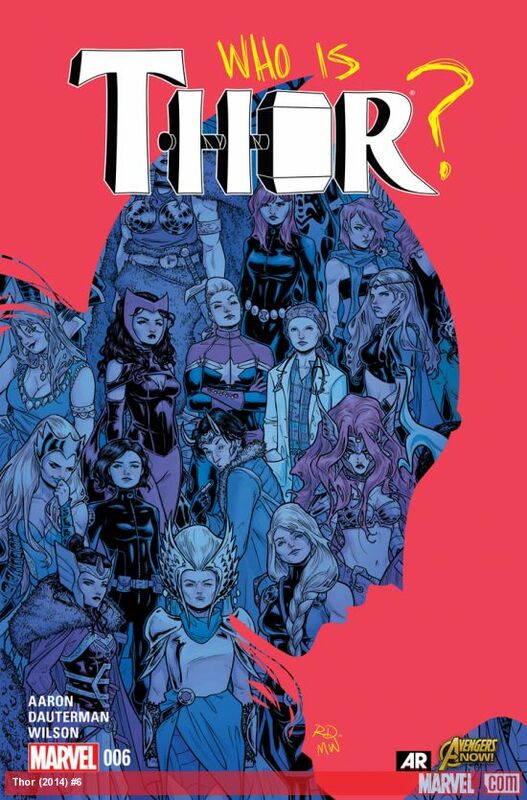 With the help of a popular SHIELD agent, Thor crosses names off his list – yes, he has made a list of women he thinks are the new Thor – and moves toward the last name of that list. While the environment themes continue here, identity emerged as a large theme – connections and ties with others builds identity rather than only names, property, or physical attributes. The large scale environment theme still continues, linking this comic together with recent Thor comics. Dario Agger is not interested in the wildlife found on Malekith’s world. He only wants to know if elves ever drill for oil. Identity is a larger, new theme that is brought out in this comic. Property, physical appearance, talents, and names are all mentioned or appear while Thor searches for the identity of the new Thor. The comic collects together all the items that a person might use to define their identity. Thor #6 is published by Marvel Comics ($3.99 USD) Jason Aaron (W.) Russel Dauterman (A.) Matthew Wilson (C.) VC’s Joe Sabino (L. & P.) Cover artwork by Dauterman and Wilson. On the opening pages, the artwork shows the castle of the Frost Giants – Utgard – against a backdrop of the dark, unending winter-night skies of Jotunheim. Layered on top of the sky is a map of the main Jotenheim continents. The map is drawn in the style of a Middle Earth map from The Hobbit or The Lord of the Rings. Skrymir, guardian of the citadel, tells Malekith a dark winter’s tale. These scenes show the blue ice sculpted halls of Utgard. Malekith stands out in his black, fluffy coat. When the scene shifts to the Roxxon Corporations base, there is a clever design choice in the separation of scenes using gutters, which is the white space between panels on the page. Thor stands on one side of a secure bunker door. Frost Giants are ready to do battle with her, but Mjolnir is stuck on the other side of the door. Dario Egger, the shapeshifting CEO of the Roxxon corporation, hides inside that bunker. Trapped inside the bunker, is the hammer Mjolnir. The page gutter is used to separate Thor from her hammer. The bunker door is depicted as the solid white space separating the panels. The main source of danger in this comic comes from separating Thor from her hammer. By doing so, Thor has to deal with the questions of how she can maintain her power and influence as the Thunder god of the Marvel Universe without Mjolnir. Frost Giants and the Dark Elf mage Malekith – The villains of Thor and Thor: The Dark World respectively – add to mounting pressure on the new Thor. Despite losing the hammer, she changes tactics, and relies on confident rhetoric, and her massive strength. The Frost Giant Skrymir tells a story of how Frost Giants treat their children. Frost Giant children are cast out into a powerful ice storm. The survivors are celebrated, and the others forgotten. This use of story telling sets atmosphere, and builds up the cruel character of the Frost Giants. Dario Egger hides in a bunker, and makes a point of how things he finds are his property. His moral range extends to the limited capacity of “Finders Keepers”. Malekith is a manipulator here. He instigates the entire conflict in the story, and appears to be working on his own plan, playing the Frost Giants like chess pieces. He successfully goads Egger into revealing his true form – a Minotaur. The comic seems to ask a question about how power and influence found and held. Like the Frost Giants treatment of their children, is it gained by overcoming cruelty, and surviving? Or like Dario Egger, is power found through bargaining and theft? Like Malekith, is power and influence found through manipulation? The new Thor, in this issue, gains power by fighting even when the odds of victory are completely against her. The comic is placing value in overcoming difficult odds. This becomes clear through Thor’s struggle with gaining power and influence, and the responsibilities that come with it. The ability to use positive self-talk under pressure helps Thor fight off the challenges thrown at her. This is another strong point put forward by Thor #3. Thor #3 is published by Marvel Comics ($3.99 USD). Jason Aaron (W.) Russel Dauterman (A. ), Matthew Wilson (C.) VC’s Joe Sabino (L.) Cover artwork by Dauterman and Wilson. 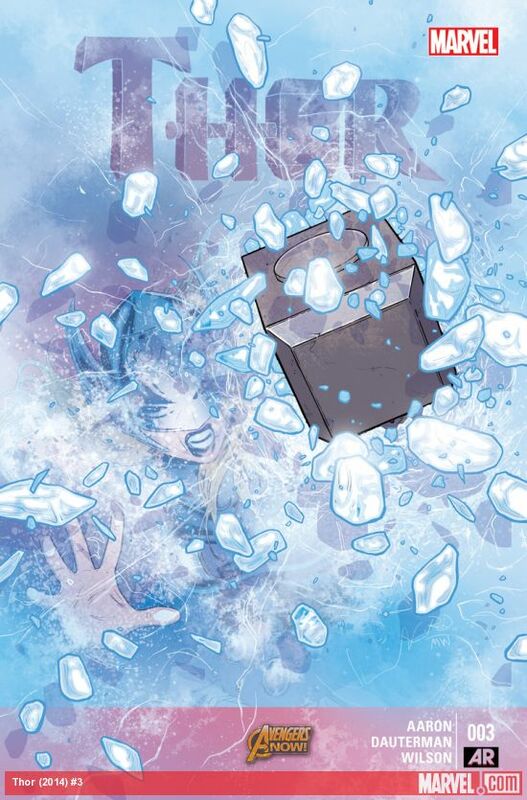 Issue #24 wraps up a long running story arc, and brings change for Thor, Roz Solomon, and Jane Foster. An example of using grey and dark artwork throughout a story, and paying off with a contrasting setting for the final pages. A major insight for Thor’s character on destruction, and a major step forward for Jane Foster. Themes of Environment protection appear in this comic, which makes sense since Thor is a weather diety. Bleak and grey backgrounds dominate the comic, and the destruction of Broxton deliberately stands as the background. Later, in the future, a verdant green field featuring Old King Thor stands out. The vast majority of backgrounds in this comic are black and burnt buildings in front of grey skies. This town has been swept away. Houses, restaurants, post offices, community centres, and pubs have been burnt down to their foundations. These scenes are bleak, and sometimes difficult to look at. The art later depicts the homeless residents of the town, standing together, and surrounded by rubble. In the distant future, the artwork of Old King Thor and his granddaughters striding across a flowing field of green grass and red flowers stands out – it’s a powerful image to end the comic. Thor’s reflection that his every visit to Midgard results in destruction is a heavy insight. living in the future, Thor finally achieves his goal of giving back to Midgard, and reversing the damage done to the Earth by various super heroes, aliens, and corporate leaders. His goal of restoration and care of the Earth is a long term goal. Jane Foster is elevated. She is awarded a new position. Earth’s representative in the council of realms. Having just read one issue, it’s unclear how important this council is. Giving Foster this position of power is a great moment for character development. Roz Solomon mistakes the Norse god Heimdall for a parking valet. Freya, Thor’s mother, and the All Mother (I’m used to hearing about Odin the All Father) is in charge of Asgard, and it’s good to see powerful female heroes here drawn directly from mythology. As a weather deity, Thor takes on the role as protector of the Earth’s environment. Contrasting Roz Solomon and Thor against the shapeshifting CEO of ROXXON diesel fuel pushes the environment theme further. It’s going to take a long time to rejuvenate the damage done to the earth today. This is clear from Old King Thor in the future presiding over a green Earth. The god of thunder will grow old before the damage done to the environment is finally reversed. He names rivers after Steve Rodgers, Jane Foster, and Roz Solomon. His friends. Back in the present day, Thor is contrasted against a villain. The CEO of Roxxon, Dario Agger, shapeshifts into a brute minotaur. It makes sense that a villain who shape shifts into a Minotaur would use deception as his primary weapon. It fits into the basic Heroes Journey storytelling structure. An evil CEO character attacking the environment isn’t original, however Agger’s arrogance and audacity are set at just the right level to entertain. The arrogant diesel fuel selling tycoon makes for a relevant villain. Climate change denial is still a thing, which is alarming. And being a weather deity’, it makes sense that Thor’s comic book would contain this valuable discussion. An environment protection theme runs throughout Thor: God of Thunder comic books. The comic is about to go an Hiatus until September. Thor’s journey continues in Original Sin: The Tenth Realm. 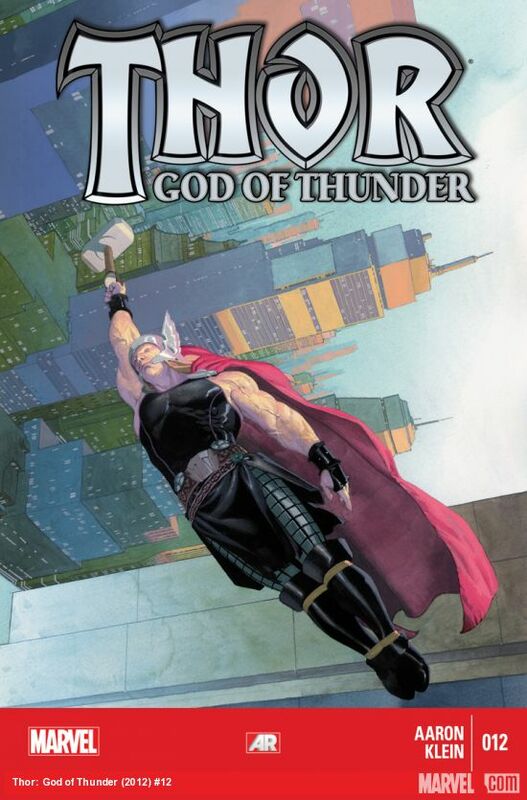 Thor: God of Thunder is published by Marvel Comics ($3.99 USD). Jason Aaron (W.) , Agustin Alessio pages 1-18 (A. ), Esad Ribic pages 19-20 (A. ), Ive Svorcina (C.) pages 19-20, VC’s Joe Sabino (L.) Cover artwork by Agustin Alessio. Thor God of Thunder #12: Once Upon a Time in Midgard. After a long stay away from his adopted home, the Norse god of thunder steals away to New York City, visiting old friends, and working miracles. Following the events of the recently concluded crude sounding story arc “The God Butcher”, Thor has takes leave from saving the Earth. What persists throughout this comic book is a sense that Thor is a guide, and a role model for the people he visits. In some cases, he offers salvation in the form of food from other worlds: Thor feeds the starving children of Rio de Janeiro with elvish delicacies, and dragon shank roasted over a fire. This is the God of Thunder as compassionate. Generous with his time, and amiable across all settings, Thor in this Marvel comic differs from the warrior Thor readers might expect from a Thor vs Hulk, or a Thor vs Superman comic book. Jane Foster returns, and a new character named Roz Solomon arrives. With old and new friends around, there’s a some catching up for Thor, which means conversations. Action might be lacking in this issue, but there’s still conflict of some substance. The greatest moment is Thor and his friend Jane Foster sitting on the moon, watching as the Earth and sun pass each other – a sunset of epic proportions. Washes of light and colour are used to flood scenes and individual panels. Since Thor is moving from place to place so often throughout the comic, these colour filters help establish a sense of place, and ease the rapid transitions. The final page of the comic is overcast by black tones, and occupied by an older version of Thor in the distant future. This contrasts with the initial page of the comic, which is covered in a white light depicts young Thor visiting vikings in 893 AD. Roz Solomon appears at a S.H.E.I.L.D academy graduation ball. Solomon asked Thor to attend this formal event as her date by posting a video online, which likely caused some amusing gossip. Thor responds to the video invitation – this seems like a superficial way to introduce a new character. Roz is an environmentalist, who was once interested in making all the other agents jealous, but invited Thor for an important reason: to remind him of the environmental damage taking place around the globe each day. She wants a god to notice the damage being done to the environment. One significant scene is three pages about capital punishment – Thor helps a man named Fulton by bringing him a last meal of a culinary calibre unheard of on Earth. The fruit of the Kandelar Tree from the planet Endoogo has a taste that is new and vibrant: The fruit presents a flavour that the taster has known seemingly all their lives. Thor then agrees to accompany the man after his death into the afterlife, no doubt to the halls of Valhalla of Norse myth. He provides nuns in a remote convent with seeds from the Quasar orchard taken from the seed library of the Halls of Life located in Omnipotence city. Thor flies to the a remote Buddhist monestary to tell stories of his adventures to the Abbot. He drinks beer with American war veterans, makes rain in a drought stricken dessert, and confronts religious fundamentalists, as they brandish sings that read “God hates you”. The set of ethics here is to follow Thor’s generosity – he offers an example to live up to. It’s also an interesting exploration of what might happen on an Earth visited by a compassionate god. Then there is the key value of the comic book: defence of the Environment. Roz Solomon asks the god of thunder if he is aware of the damage being done to the environment. Old Thor walks across an Earth turned to ash, with no life anywhere. Does this result prove Roz Solomon right? The IPCC , The Intergovernmental Panel on Climate Change, conducts the kind or research that Roz Solomon would work on as an environmental scientist. NASA delved into the findings of the IPCC reports, and noted that the costs and damage of climate change will be significant and increase into the future. This accounts for the desolate, grey, and un-living world the older Thor walks over. The themes that run through the comic book are protection for the environment, in addition to charity and selflessness. The position about capital punishment is ambiguous, however: is capital punishment acceptable as long as the criminal being put to death is treated to some comfort (food, friendship) to ease the execution? Should Thor have interfered with the law of the state he was in and freed the man? A welcome glimpse into Thor’s world outside of his influence on the Avengers and other Marvel comics re-introduces old friends, and introduces new ones. A break from Thor’s adventures crossing the universe, which could easily have felt like a waste of time, is a strong comic with good character moments. 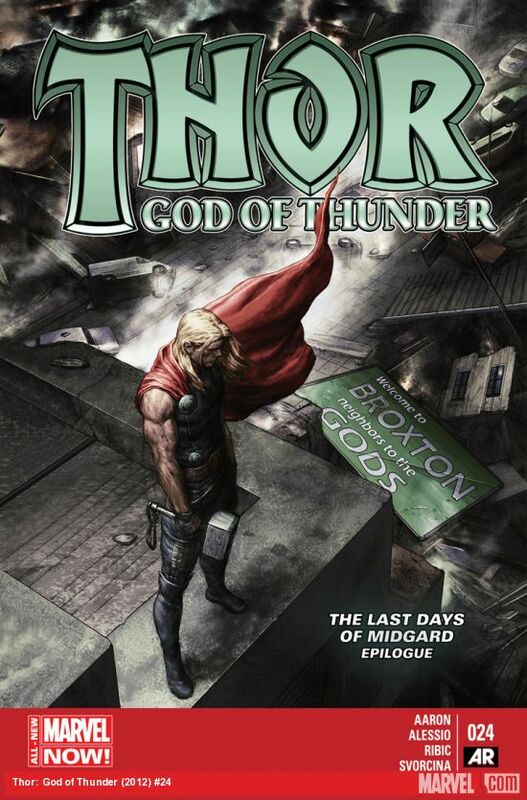 Thor God of Thunder #12 is published by Marvel Comics ($3.99 USD). Jason Aaron (W.) Nic Klein (A.) 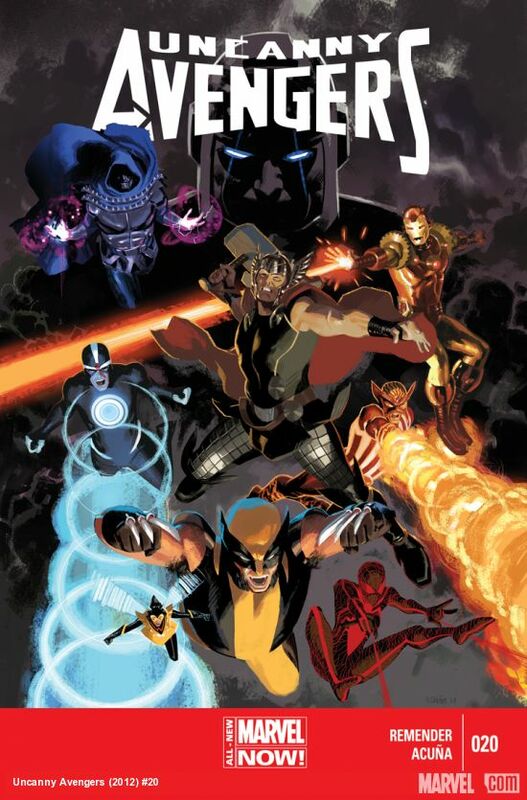 VC’s Joe Sabino (L.) Cover art by Esad Ribic.